Dieses Hotel für Familien liegt in den Bergen, 4,6 km von Katse Talsperre entfernt. Diese Lodge für Familien liegt in den Bergen, 47,5 km von Leribe Stone entfernt. Diese Lodge für Familien dank der guten Lage (Butha-Buthe) nur 47,4 km von Leribe Stone entfernt. Diese Lodge liegt in Butha-Buthe, 47,4 km von Leribe Stone entfernt. 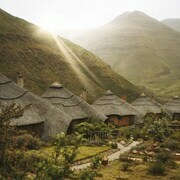 We recently stayed at Maliba in both the self-catering River View unit and the 5* Mountain Chalets. The self-catering chalets boast excellent views over the river and mountains. 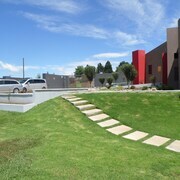 These are fully kitted out units, close to the hiking trails and pools, making them perfect for families. The lounge area could use a bit of work as the seating area (traditional concrete couch) is worn, torn and old. The chalets could also do with the inclusion of a television in the lounge - it doesn't sound too important for a getaway to nature but if it rains all day and you're inside, you are limited to sitting on the bed due to the poor condition of the couch and lack of "entertainment" in the living room. Having said this, it's a minor detail and the chalets are amazing. 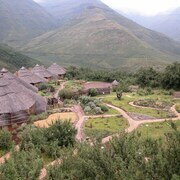 The 5* Mountain Lodge blew us away though!!! On first glance these huts look well kept and very smart, however, once you walk inside you're struck by the size of the suite and the quality! 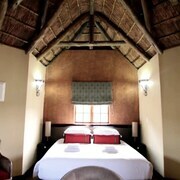 The room is massive and has a fireplace, sun loungers to relax outside on your patio, and a tv (with DSTV). Ours (#1) also came with a private viewing platform just outside the door, overlook the mountains and valley!! The best room and best views we've ever had at any hotel / lodge around the world! On top of everything, we met some of the nicest and most welcoming staff. 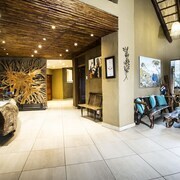 From the time you enter the lodge, you're greeted by smiles and this continues throughout the stay. The staff were excellent! 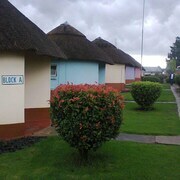 Best hotel in Southern Africa!!!! It did not run anymore. I had to pay for the night at an other hotel nearby. Informieren Sie sich über unsere Auswahl an Hotels in Lesotho und benutzen Sie die Karte um gezielt nach Hotels in der gewünschten Lage in Lesotho zu suchen. 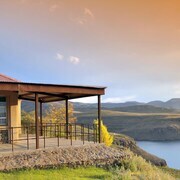 Mithilfe der Filter können Sie Hotels in Lesotho nahe einer Sehenswürdigkeit anzeigen oder ein bestimmtes Thema, eine bestimmte Marke oder einen Hotelstandard von 1 Stern Hotels bis luxuriösen 5 Sterne Hotels in Lesotho finden. Sie suchen ein romantisches Hotel in Lesotho um Tage zu zweit zu verbringen? Oder sind Sie auf der Suche nach Entspannung in einem der zahlreichen Wellnesshotels in Lesotho? Für Eltern mit Kindern gibt es familienfreundliche Hotels in Lesotho, wo Kinder mehr als willkommen sind. 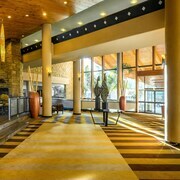 Auch eine große Auswahl an Business- und Seminarhotels in Lesotho gibt es bei Expedia.de. Bei Expedia finden Sie garantiert das perfekte Hotel, ganz egal was der Anlass Ihrer Reise ist. Geben Sie Ihren Reisetermin ein, um rechtzeitig die besten Angebote zu Hotels in Lesotho zu bekommen. Lesotho mit EXPEDIA entdecken: Flüge, Mietwagen & Co.
Entdecken Sie Lesotho und finden Sie die besten Flüge, Mietwagen, Flug+Hotel-Angebote, Tickets und mehr!